The Automated Floor Drilling Equipment (AFDE) for the Boeing 767 and KC46A is a fully CNC controlled machine which drills the floor grid of the fuselage. A 13-foot wide drilling span allows consolidation of floor drilling into a single swath. 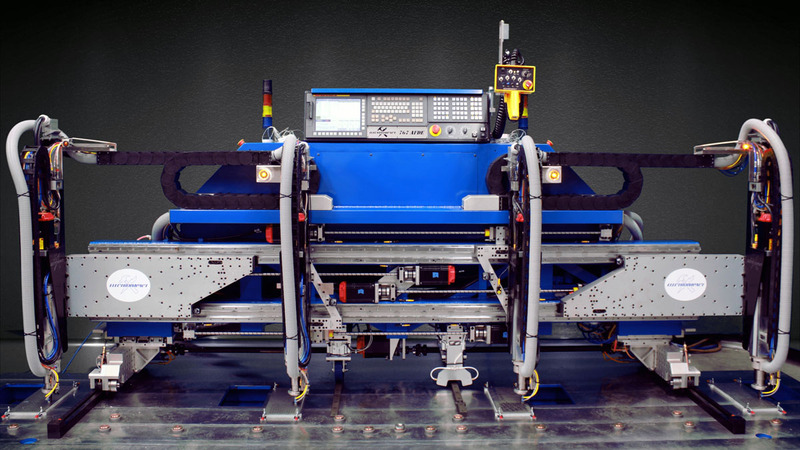 A lightweight machine minimizes floor grid deflection. Four servo-driven, air-cooled spindles allow high rate drilling through titanium and aluminum. Electroimpact worked with GMN USA to develop a compact and lightweight (37 lb) spindle cartridge, capable of 64 in-lb constant torque at speeds from 0-7000 RPM and 5.34kW power. The spindles are air-cooled to eliminate the extra weight and complexity of liquid cooling. The spindles use HSK 40 taper for maximum tool retention and rigidity. Tribos toolholders allow access in tight spaces around airplane geometry while retaining room for chip flow inside spindle nosepieces. The nosepieces were optimized for the application to clear upstanding floor structures. Drilling debris and cutting fluid are contained and removed via vacuum, resulting in a cleaner aircraft. A custom CNC interface utilizes Fanuc Picture to simplify machine operations and troubleshooting. To minimize total drill time all four drills on the AFDE can drill simultaneously, each with its own independent drilling parameters including feed rate and chip load. Drilling parameters are controlled with a unique mode of part programming designed to provide Boeing with maximum flexibility and simple, compact part programs. Bridge track tooling interfaces between the machine and the aircraft grid. An offline calibration plate and transportation dolly complete the cell.